Intoduction: Fixed orthodontic treatment has a high risk of enamel demineralization. Sealant containing selenium is a material that has been developed to prevent enamel demineralization and stated to be applicable as a primer bracket adhesion. Aim and Objective: This aim of this study was to investigate the shear bond strength (SBS) of an orthodontic bracket after application of sealant containing selenium as a primer. Materials and Methods: A total of 100 extracted human premolars were used in this study, which were randomly divided into two groups. Group I consisted of 50 teeth as the control group, to which a conventional primer (CP) was applied, whereas for group II comprising 50 teeth, a sealant containing selenium selenium primer (SP) was applied. SBS of the orthodontic brackets was measured using a universal testing machine. 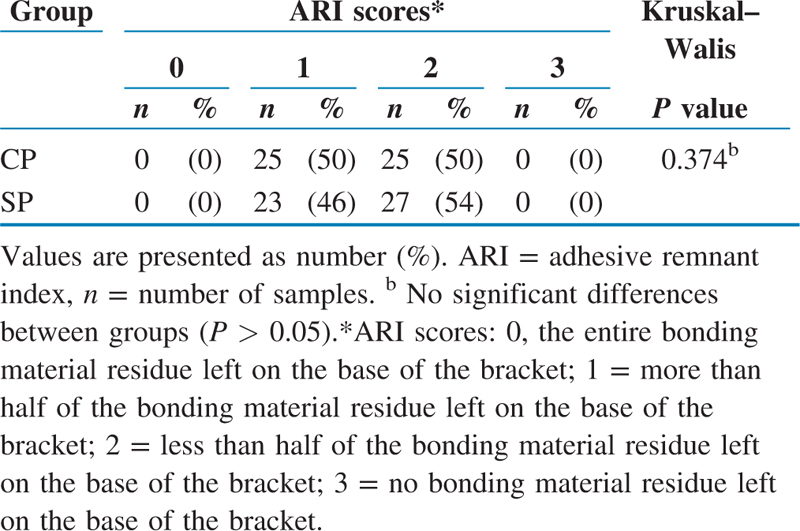 The adhesive remnant index (ARI) scores were calculated to determine the location of the bond failure using a stereomicroscope. A t test was used for analyzing the SBS data, whereas the Mann–Whitney test was used for analyzing the ARI scores. Results: There was no significant SBS difference (P > 0.05) between CP and SP groups. CP groups showed slightly higher SBS [9.05 ± 3.10 megapascal (MPa)] than that in the SP groups (8.21 ± 3.78 MPa). The bond failures of both the groups occurred at the adhesive–adhesive interface. Conclusion: The results showed that sealant containing selenium can be used as a primer within orthodontic adhesive material, as the physical–mechanical properties remained unchanged. People who undergo orthodontic treatment are at a higher risk of enamel demineralization caused by Streptococcus mutans than that of people who do not undergo such treatment. An architecture of orthodontic bracket may create challenges to maintain good oral hygiene, leading to plaque accumulation that can raise the level of microorganism in oral cavity and provoke enamel demineralization. White spots are an early sign of enamel demineralization, which may lead to development of caries. Enamel demineralization can be prevented using an orthodontic sealant that can be applied on the teeth around the bracket, which results in greater protection of the enamel. The orthodontic sealant material must have the characteristics of being resistant to oral environments, such as brushing, food, and saliva, and also to discoloration due to esthetic reasons. Antibacterial agents can also be combined to adhesive material to prevent enamel demineralization. Chlorhexidine (CHX) has been added to orthodontic composites, but its release is highly dependent on its initial concentration within the material. At a higher concentrations, CHX may interfere in the mechanical and physical attributes of adhesive materials. Furthermore, the long-term use of CHX can be correlated with side effects such as desquamation of mucous membranes, a damaged sense of taste, tooth staining, and specific irritation. Orthodontic sealant containing selenium is a material that has been developed to prevent enamel demineralization. Organo-selenium is polymerized into this dental sealant, which is effective in restraining bacterial adherence and the development of biofilms by two major oral pathogens, namely, S. mutans and S. salivarius. Based on these facts, it is necessary to determine the shear bond strength (SBS) of the sealant containing selenium as a primer that is used within orthodontic adhesive material, because as primer and sealant material, they should be durable and can withstand daily force. In this present study, we also used an artificial mouth system (AMS) to approach and mimic the real situation in oral cavity, as the oral environment dynamic conditions, however, also influences the bonding strength. This experimental laboratory study was approved by the Ethics and Advocacy Unit of the Faculty of Dentistry, Universitas Gadjah Mada, Indonesia, with the number 001142/KKEP/FKG-UGM/EC/2017, on June 11, 2017. The study was conducted using the maxillary first premolars extracted for orthodontic plans. The inclusion criteria for the teeth were as follows: the enamel surface of the buccal tooth must not have undergone etching process, and there should be no caries, fractures, and cracks on the surface of the buccal tooth. The teeth were exposed to scaling procedure using Ultrasonic Scaler (Woodpecker UDS-A LED, China) to eliminate organic debris, washed, and disinfected with 0.5% chlorine for 1 week at 25°C, which was revived once for 2 days to restrict bacterial contamination. A total of 100 premolar teeth were randomly divided into two groups: a conventional primer (CP) group and a sealant containing selenium (SP) group (n = 50). One hundred stainless steel standard straightwire premolar brackets (Forestadent, Germany) and a bracket base surface area of 10.86 mm2 were used for the study. The bracket was placed on the mid-axis of the buccal surfaces of the teeth with a bracket holder gauge. The teeth were etched using 37% phosphoric acid (Scotchbond; 3M Unitek, Monrovia, California, USA). An uniform thickness of primer agent (0.5–1 mm) was applied on the enamel surface of each sample (CP materials in CP group and the sealant containing selenium in SP group, respectively). Then, a resin composite (Transbond XT; 3M Unitek) was applied on the base of the bracket, followed by light curing for 40 s according to the manufacturer (10 s for each side: mesial, occlusal, gingival, and distal) using a quartz–tungsten–halogen light-curing unit (Litex 680A; Dentamerica, Industry, California, USA) with a light intensity of 450 mW/cm2. Next, the teeth were soaked in sterile saliva for 1 h to form a pellicle and then incubated for 1 day in the AMS that was described by Morita et al. [[Figure 1]]. The AMS consists of (1) a tube for storing brain heart infusion (BHI) broth stock to be used as the bacterial nutrition media, (2) a saline tube for soaking the teeth in BHI media and then washing, and (3) a tube in the incubator for maintaining the teeth in an anaerobic condition and preventing contamination. The bases of the BHI and the saline tubes were covered using a rubber stopper that was connected to a hypodermal needle to maintain the number of drops of media passing through the tube in the incubator, with the drip rate being six drops per minute. The drops in the BHI and the saline tubes were concentrated in the middle of the teeth sample. The bottom of the tube in the incubator was installed with a valve to dump residual media at the bottom of the tube. The Falcon tube was covered to place the tooth on the tube, which was then placed in the incubator equipped with a thermostat to maintain the temperature at 37°C. The bacterial suspension was prepared using a method described by Morita et al. with some modification. S. mutans ATCC 25175 bacteria were grown in BHI agar and anaerobically incubated at 37°C for 24 h. The bacterial suspension was prepared by taking 1 dose of S. mutans, added to sterile distilled water, and then diluted to 0.5 McFarland concentration (1.5 × 108 CFU/mL). 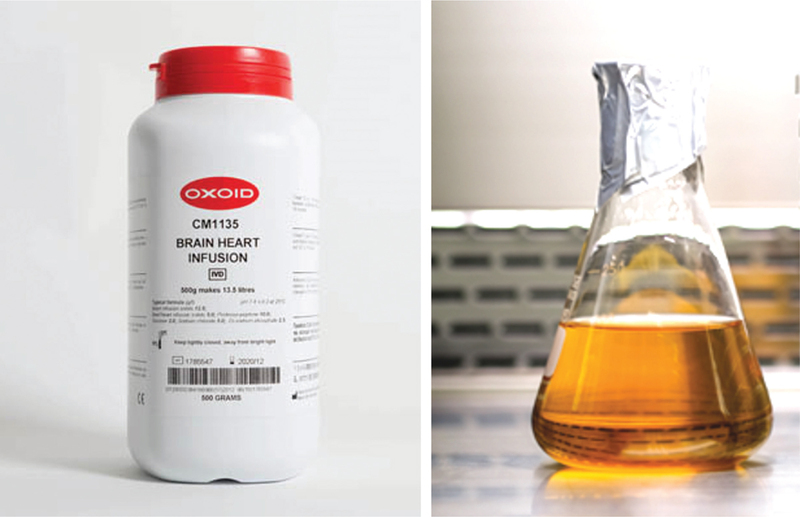 The BHI broth medium was prepared by mixing 18.5 g of BHI broth powder (Oxoid, UK; [Table 1] and [Figure 2]) and 500 mL of distilled water in an Erlenmeyer flask. The top of the Erlenmeyer flask was covered with aluminum foil and fed into an autoclave at 121°C for 20 min to prevent contamination. Saliva was collected from individual saliva donors with good oral and systemic health. Donors were instructed to eat breakfast and brush their teeth, after which they were not allowed to eat and drink 2 h before the saliva collection. Saliva collection was conducted during 9.00 to 10.00 AM to minimize the diurnal effect that may influence the composition of saliva. 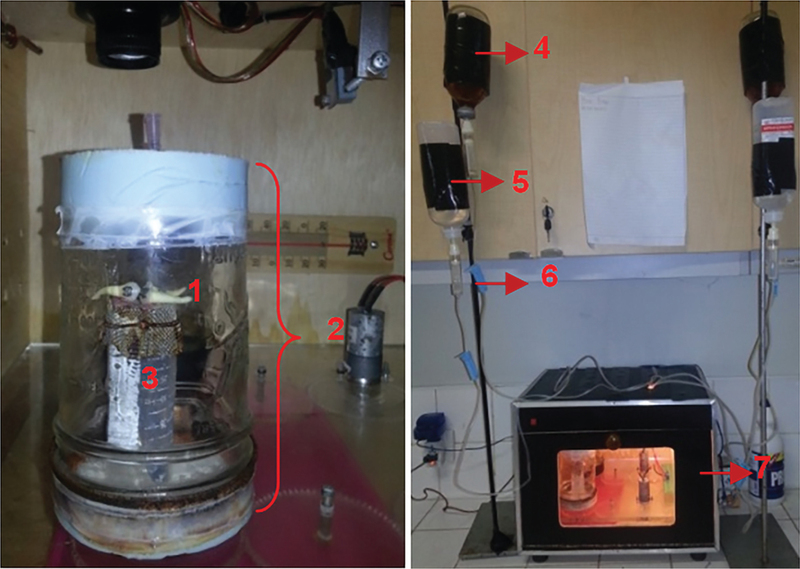 The saliva collected in a tube was centrifuged at 1000×g for 20 min; the obtained supernatant saliva was sterilized by filtration using a Millipore filter unit and then stored at 4°C in a cold room before being used for the study. The SBS test was carried out using a universal testing machine (UTM) with a speed of 0.5 mm/min. The obtained data included the maximum force on the UTM when the bracket came off the dental surface, which is expressed in Newton units and then converted into megapascal (MPa) units by dividing the force over the surface area of the bracket (N/mm2). The adhesive remnant index (ARI) was calculated to determine the location of attachment failure by observing the residual adhesive that remained on the bracket base under a stereomicroscope with 10× magnification. The observation results were then scored as described by Artun and Bergland. The shear strength data and the ARI scores were analyzed using a t test and the Mann–Whitney test, respectively. The normality test of groups I and II showed that the data were normally distributed (P > 0.05). Data homogeneity was then tested using Levene’s test, which showed that the tested variants were homogeneous (P > 0.05), suggesting that further analysis can be continued using the t test [[Table 2]]. The t-test results shown in [Table 2] reveal that there were no differences in the SBS between the CP group and the sealant containing selenium group (P > 0.05). The Mann–Whitney test showed that there were no differences in the ARI scores after debonding between the CP group and the sealant containing selenium group (P > 0.05). The SBS of the metal bracket attachment in the group that received the sealant containing selenium was 8.21 ± 0.84 MPa, whereas the group that received the CP application showed SBS of 9.05 ± 1.10 MPa [[Table 2]]. The optimal SBS that is needed to bond with the enamel has been reported to be an average of 4 to 10 MPa. Thus, the average shear strength of the sealant containing selenium in this study was found to be within the normal range of the optimal strength of the bracket attachment. Statistical analysis using the t test showed that there was no difference in the average shear strength between the sealant containing selenium application group and the CP group. This suggests that the orthodontic sealant containing selenium can be used as a primer material on the bracket attachment using a composite resin based on its optimal shear strength. The absence of differences in the bond strength between the two groups could be because of the low viscosity of the content of both the materials, which makes it easier to enter into the enamel pores, resulting in mechanical interlocking attachment. The primary ingredients of a CP are 45% to 55% of bisphenol A diglycidyl methacrylate (BisGMA) and 45% to 55% of triethylene glycol dimethacrylate (TEGDMA). BisGMA has high viscosity (1200 hPa), whereas TEGDMA has low viscosity (0.01 hPa). TEGDMA is usually added to BisGMA to dilute the highly condensed BisGMA. The primary ingredients of sealants with selenium content are 46.34% of BisGMA, 38.91% of TEGDMA, and 4.43% of selenium. The selenium is diSe-acetoacetoxy ethyl methacrylate, which is a low-viscosity monomer (0.9 hPa). Based on the primary composition of both the materials, it can be stated that the CP and the selenium-containing sealant have a comparable low viscosity. Alkurdi and Abboud stated that the adaptation of an adhesive material to the enamel is related to the viscosity of the material; a low-viscosity material will readily flow further the micropores, enabling quick placement and precise adaptation to the contact surfaces. It is important to consider the location of the bonding failure while selecting orthodontic adhesive materials as it is related to the enamel damage. Failure of the bracket attachment system may occur between adhesive–enamel, adhesive–bracket, or adhesive–adhesive interfaces. As shown in [Table 3], both the CP material group and the sealant containing selenium group have ARI scores of 1 and 2, which implies that some of the adhesive material remains in the enamel and bracket base, thereby indicating that the bonding failure occurs between the adhesive–adhesive materials. Regarding the location of the bonding failure, no difference was observed between the CP material group and the sealant containing selenium group, as shown in [Table 3]. Failure of bonding between the adhesive–bracket and adhesive–adhesive interfaces is generally considered safer than that of the adhesive–enamel interface. This is because some studies have shown that debonding can cause the loss of enamel in the form of cracks that compromise enamel integrity and cause esthetic problems if the failure occurs between the enamel and the adhesive.An ideal adhesive material should produce adequate bond strength, must prevent enamel demineralization, and should not cause enamel damage during debonding. Thus, the sealant containing selenium material is quite ideal to be used as a primer on the composite resins as it has adequate strength and also contains antimicrobials that can prevent the occurrence of enamel demineralization during fixed orthodontic treatment. Further research is needed to analyze the bonding strength and the location of the bonding failure of metal brackets with sealant containing selenium that are used for a period of 1 to 2 years (according to the orthodontic treatment), including research on enamel structure after debonding. The SBS of the sealant containing selenium material was found to be similar to that of the CP when used for bracket attachment with a conventional composite resin. The bonding failure of the sealant containing selenium material and the CP materials when used for bracket attachment with conventional composite resins occurs between the adhesives themselves. Calabrich CF, Barbosa MC, Simionato MR, Ferreira R. Evaluation of antimicrobial activity of orthodontic adhesive associated with chlorhexidine-thymol varnish in bracket bonding. Dent Press J Orthod 2010;15:62-8. Avriliyanti F, Suparwitri S, Alhasyimi AA. Rinsing effect of 60% bay leaf (Syzygium polyanthum wight) aqueous decoction in inhibiting the accumulation of dental plaque during fixed orthodontic treatment. Dent J (Majalah Kedokteran Gigi) 2017;50:1-9. Pithon MM, Santos MJ, de Souza MA, Filho JCBL, Braz AKS, de Araujo RE et al. Effectiveness of fluoride sealant in the prevention of carious lesions around orthodontic brackets: An OCT evaluation. Dent Press J Orthod 2015;20:37-42. Premaraj TS, Rohani N, Cove D, Premaraj S, Yi Hua, Watanabe H. An in-vitro evaluation of mechanical and esthetic properties of orthodontic sealants. Eur J Dent 2014;8:487-92. Becci ACO, Marti LM, Zuanon ACC, Brighenti FL, Spolidório DMP, Giro EMA. Influence of the addition of chlorhexidine diacetate on bond strength of a high-viscosity glass ionomer cement to sound and artificial caries-affected dentin. Rev Odontol UNESP 2014;43:1-7. Marti LM, Mata M, Ferraz-Santos B, Azevedo ER, Giro EMA, Zuanon ACC. Addition of chlorhexidine gluconate to a glass ionomer cement: A study on mechanical, physical and antibacterial properties. Braz Dent J 2014;25:33-7. Tran P, Hamood A, Mosley T, Gray T, Jarvis C, Webster D et al. Organo-selenium containing dental sealant inhibits bacterial biofilm. J Dent Res 2013;92:461-6. Uysal T, Amasyali M, Koyuturk AE, Ozcan S. Effects of different topical agents on enamel demineralization around orthodontic brackets: An in vivo and in vitro study. Aust Dent J 2010;55:268-74. Morita A, Yulianto DK, Kusdina SD, Purwanti N. Differences of Streptococcus mutans adhesion between artificial mouth systems: A dynamic and static methods. Dent J 2016;49:67-70. Baek JH, Krasieva T, Tang S, Ahn Y, Kim CS, Diana Vu et al. Optical approach to the salivary pellicle. J Biomed Opt 2009;14:1-7. Waldetoft KW, Mohanty T, Karlsson C, Mörgelin M, Frick IM, Malmström J et al. Saliva-induced clotting captures streptococci: Novel roles for coagulation and fibrinolysis in host defense and immune evasion. Infect Immun 2016;84:2813. Artun J, Bergland S. Clinical trials with crystal growth conditioning as an alternative to acid-etch enamel pretreatment. Am J Orthod 1984;85:333-40. Hellak A, Ebeling J, Schauseil M, Stein S, Roggendorf M, Korbmacher-Steiner H. Shear bond strength of three orthodontic bonding systems on enamel and restorative materials. BioMed Res Int 2016;2016:1-10. Anonim. Safety data sheet (Transbond XT primer). USA: 3M; 2016. Gajewski VES, Pfeifer CS, Fróes-Salgado NRG, Boaro LCC, Braga RR. Monomers used in resin composites: Degree of conversion, mechanical properties and water sorption. Braz Dent J 2012;23:508-14. Reid ME, Stratton MS, Lillico AJ. A report of high-dose selenium supplementation: Response to toxicities. J Trace Elem Med Biol 2004;18:69-74. Alkurdi RM, Abboud SA. Clinical evaluation of class II composite: Resin restorations placed by two different bulk-fill techniques. J Orofac Sci 2016;8:34-9. Heravi F, Shafaee H, Abdollahi M, Rashed R. How is the enamel affected by different orthodontic bonding agents and polishing techniques? Tehran J Dent 2015;12:188-94. Mezomo M, Bolzan AG, Marquezana M, Martinelli M, De Lima S. Shear bond strength of orthodontic brackets bonded. Rev Odonto Cienc 2013;28:71-5. Klocke A, Tadic D, Kahl-Nieke B, Epple M. An optimized synthetic substrate for orthodontic bond strength testing. J Dent Mater 2003;19:773.